After playing hooky from New Egypt last week to attend the Wildwood car show, I was glad to be back. Last night had plenty of great racing. The highlight of the night had to be Frank Cozze Jr. winning his 1st Modified heat at NES, possibly his 1st ever? 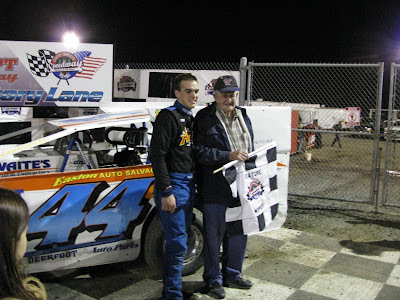 I did a horrible job last night of tracking the Sportsman and Outlaw Stock winners, but you can get the complete results at www.NewEgyptSpeedway.net. Modified Big Block Heat 1: Frank Cozze Jr. wins, Tanner wrecks in Turn 3, Pauch and Guarino looking strong. Of note (to me anyway) was Johnny Guarino, who moved from 11th to 3rd. I believe this is Johnny's 1st year at NES, and he is looking pretty good. He managed to stay ahead of Pauch as they both moved to the front. Unfortunately, both Pauch and Guarino ended their night after a lap 20 restart incident involving several cars. Pauch went out on a hook and the 9 car limped home at the back of the pack. I had my head turned on the incident, so I'm not sure what happened, but I don't think either Pauch or Guarino were at fault. I predict we will see the 9 car of Johnny Guarino in Victory lane at NES in 2009. If Johnny Mac posts some in-car footage of the heat, I will link to that as well.